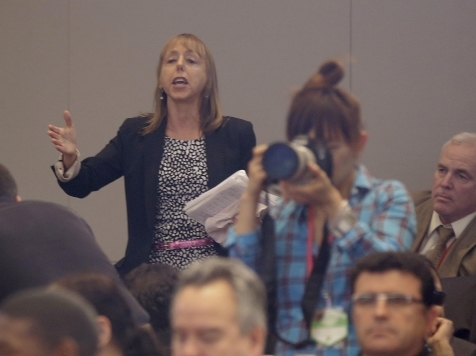 Who Invited Code Pink's Medea Benjamin to Obama's Speech? “The voice of that woman is worth paying attention to.”-President Obama paying homage to terrorist supporter Medea Benjamin. President Barack Obama was heckled Thursday by leftist terrorist ally Susan ‘Medea’ Benjamin while giving a speech on national security issues at the National Defense University at Ft. McNair in Washington, D.C. Curiously, Obama’s staff let Benjamin interrupt and engage Obama several times on issues like Guantanamo and drones over several minutes before she was forcibly removed from the press rows in the back of the auditorium where the speech was being given. Benjamin initially told The Huffington Post she was invited to attend Obama’s speech by someone she declines to name. The National Defense University Public Affairs office issued a statement that Benjamin came in through the media. If standard security procedures for a presidential event were employed, Medea Benjamin would not have been allowed in the same room with a president of the United States. 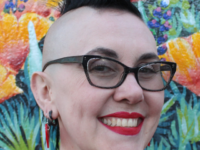 In the past decade Benjamin and the group she co-founded, Code Pink, have worked with state sponsors of terrorism, terrorist groups and domestic terrorists to undermine the U.S. and her allies in the war on terrorism. However, Benjamin and Code Pink have also worked with President Obama at the same time to accomplish some of the same goals–beginning in early 2007 when Obama tapped Code Pink co-founder Jodie Evans as a fundraising host and then as a fundraising bundler for his nascent presidential campaign. Code Pink has even acted, at times, as a messenger between terrorists and Obama. Given her background, Benjamin’s submission to be cleared by the Secret Service for the event, even as press, would have lit up the protective agency’s computer screens like a Christmas tree. Her ties to Hamas, Hezbollah, the Iraqi ‘resistance’, Iran and Cuba, etc., would raise red flags that would likely have to be overridden by someone in the Obama administration’s press or public engagement office. The questions arise as to who invited Benjamin in the first place and who cleared her? Was it someone in the Obama administration, or was it someone on the faculty at NDU? Either way, it raises troubling scenarios. Did the Obama administration plant a heckler like they planted a questioner to break the IRS scandal? Or did someone at the National Defense University commit an act of gross insubordination to embarrass their commander-in-chief on national television? Democrats have a history of giving Benjamin and Code Pink special passes to score political points. For example the group was given seats up close so they could harass President George W. Bush at his second inaugural in 2005 and again in 2009 when Bush turned over the presidency to Barack Obama. Code Pink was granted access to Walter Reed Army Medical Center by on-base sympathizers to undermine the morale of the wounded soldiers and their families. In the past, Benjamin, Jodie Evans and Code Pink have used stolen or phony press passes and IDs to gain access to secure events. Benjamin also uses Code Pink’s parent group, Global Exchange, for phony press passes. A Daily Kos diarist wrote about how Benjamin asked him to create Global Exchange press passes that were used to infiltrate an event President Bush spoke at in 2008. This was another security failure that led to the spectacle of a Code Pink protester charging toward Bush while he spoke. BREAKING: Bush heckled at Monticello by CodePink! Early this morning I found an unusual email from Medea Benjamin waiting for me in my inbox. It seems that last week when she was arrested in Florida, they confiscated her Global Exchange press pass, and could I make her another one? Ever since I figured out how to duplicate Medea’s press pass for other members of CodePink, I have been doing so with her blessing. Since Medea is the founding director and CEO of Global Exchange as well as one of the founders of CodePink, how I implemented it may be a bit of a hack; but it is quite legitimate insofar that yes, these are valid press passes for a news organization, created with the full knowledge and permission of the company director. Now, ironically, I was going to have to whip out a copy of the document that served as the original. As they work with our terrorist enemies overseas and high-ranking Democrats, Benjamin and Code Pink also harass our military and their families on the home front. At Walter Reed, Benjamin and Code Pink called the wounded warriors there “terrorists” and “war criminals.” At an Obama White House Halloween party for children of service members, Benjamin and Code Pink terrorized the kids waiting to get in by acting as ghosts of dead soldiers and bloodthirsty witches. Barack Obama says terrorist supporter Medea Benjamin is a voice worth paying attention to. When will someone in the mainstream media challenge Obama on his ties to Code Pink?